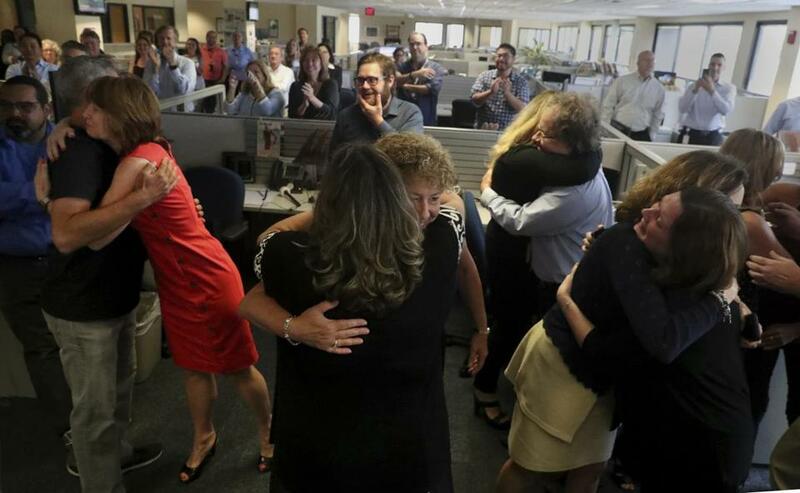 Staff members of the South Florida Sun Sentinel celebrated their bittersweet honor Monday in Deerfield Beach, Fla., after winning the Pulitzer Prize for Public Service. The newspaper won for its coverage of the Parkland school shooting. NEW YORK (AP) — The South Florida Sun Sentinel and the Pittsburgh Post-Gazette won Pulitzer Prizes on Monday and were recognized along with the Capital Gazette of Maryland for their coverage of three horrifying mass shootings in 2018 at a high school, a synagogue and a newsroom itself. The Boston Globe’s Craig F. Walker was a Pulitzer finalist for his photographs of Connor, who lives at the intersection of autism and mental illness. ‘‘This is a story that everybody was not really paying good attention, and we’re very happy to be able to draw some attention to it,’’ Michael said. Images of the famine in Yemen also brought a feature photography award for The Washington Post. The Post’s book critic, Carlos Lozada, won the criticism prize for what the judges called ‘‘trenchant and searching’’ work. Bell, the editorial cartooning winner, called out ‘‘lies, hypocrisy and fraud in the political turmoil surrounding the Trump administration,’’ the Pulitzer judges said.